The first quadrille at Almack's. England regency period 1818. Home » The first quadrille at Almack’s. England regency period 1818. The first quadrille at Almack’s. England regency period 1818. The first quadrille at Almack’s, c. 1818. 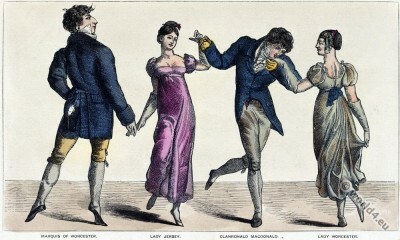 Four figures dancing at the club Almack’s: Marquis of Worcester; Lady Jersey; Clanronald Macdonald and Lady Worcester. Tags: Regency period. Georgian Fashion. France Empire, Romantic era. Biedermeier era. Dandy Clubs – Dandysme, Satirical 19th century. This entry was posted in 1818, 19th Century, England, Georgian period, Regency period, Romantic Era and tagged Dance costumes, Dandy, Regency period, Romanticism fashion, The Reminiscences and Recollections of Captain Gronow on 2/27/15 by world4.